The solar panels outside Butler Electric Cooperative face the southwest to maximize production during peak demand. Out in the middle of Kansas, a rural electric cooperative and a couple of solar installers have found common cause in, of all things, a demand fee. Eight years ago, the Butler Rural Electric Cooperative instituted a demand fee for all of its customers, including residential. While the fees are seldom a reason for solar advocates to celebrate, in this case both the utility and a couple of customers have found that if solar panels are oriented towards the southwest, everybody seems to benefit. The co-op instituted the system-wide demand fee in 2009 and simultaneously reduced its energy charge. Customers are charged $5.10 per kilowatt of demand registered during the utility’s peak hours – now defined as the window from 3 to 6 p.m. Demand is measured monthly, but the minimum demand fee for a month is no less than 70 percent of the maximum demand registered during the preceding July and August. For a typical residential solar customer, that could amount to about $25 per month. Mark Horst, owner of King Solar, was looking for a way to keep solar production financially viable in spite of the new fee. He hit on the idea of turning the panels towards the west or southwest instead of the south, as they are conventionally oriented. By increasing production during the late afternoon, he figured he could cut the demand fee enough to make it all work. He said he’s done that so far for two Butler customers. Matt Pascal, who owns Alternative Energy, also convinced a couple of his solar customers within Butler’s service territory to turn their panels in a western direction, sacrificing some daytime production for more output during the late afternoon. Andy Rondon, sales manager for Good Energy Solutions in Lawrence, Kansas, sees value in shifting panels to the southwest, but only if utilities have a policy of rewarding it in some way. Individual customers who orient their panels for the purpose of reducing a demand fee may be undermined by clouds passing overhead at the wrong time. “If you don’t have a battery, you’re hinging on the weather cooperating,” he said. He has, however, tried to persuade a couple of municipal utilities in Kansas to experiment with offering rebates for panels oriented in a direction that would put less of a burden on the grid during peak, late afternoon hours. The city utility in Columbia, Missouri began offering just such a rebate on Aug. 1. Since he heard about that, Rondon said, “I’ve been trying to pitch the idea to people in decision-making roles, telling them, ‘If you give me a reason as an installer to put modules facing southwest and west, you get a tangible benefit also.’ ” He has proposed, for example, that utilities increase net-metering caps on systems facing west or southwest. Although he agreed that southwest-facing panels might help defray demand charges in some instances, a solar industry spokesman couldn’t generate much enthusiasm for the arrangement. And yet, Butler’s approach appears to be working in Kansas. Griffin said the utility in recent years has reduced its peak demand by 1 megawatt or more. Although the utility’s position used to be “consume, consume, consume,” Griffin said it no longer feels invested in hiking sales. Indeed, he takes obvious pride in the fact that Butler is selling less electricity than it did a few years ago. He attributes it largely to efforts to encourage customers to conserve, and a small degree to solar installations. He’d like to see the utility’s power sales fall even more. To that end, Butler installed its own 4.5-kilowatt solar array — southwest-facing, of course — on the grounds of its office. Griffin said the company is considering a larger solar installation. 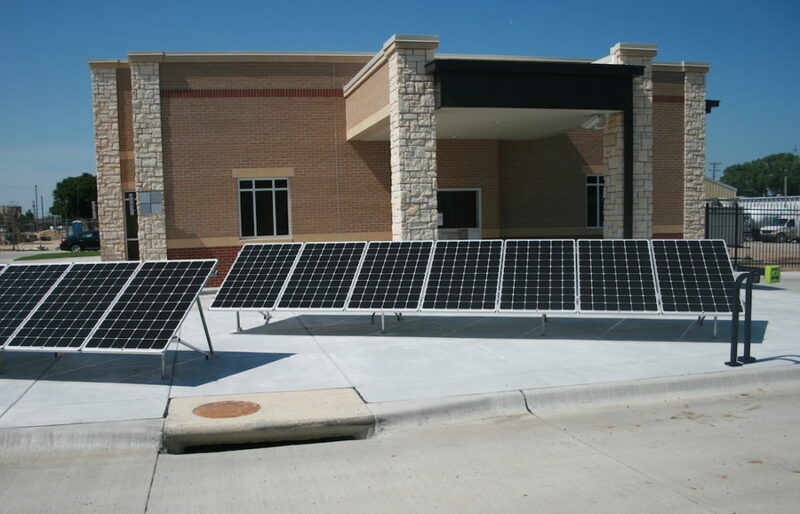 Ironically, the office doesn’t get the maximum benefit from its southwest-facing panels because it actually gets its power from Westar, one of the state’s major utilities. Westar doesn’t charge customers a demand fee, meaning there would be no benefit in orienting solar panels any direction but south. However, the utility has indicated it might seek regulatory approval of a demand fee in the next year or two.